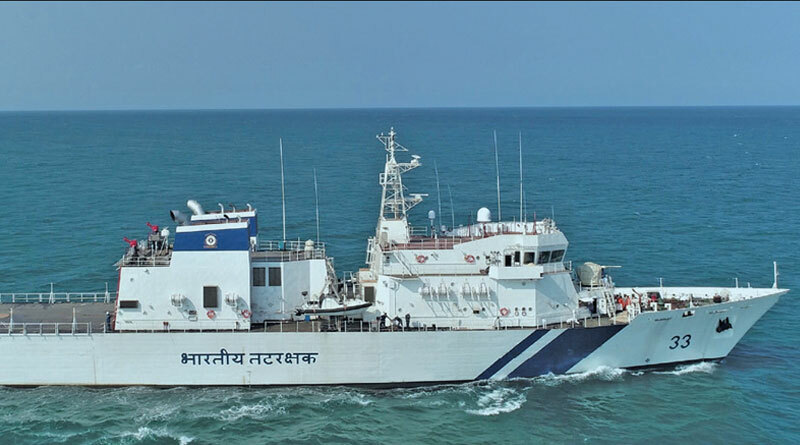 Larsen and Toubro (L&T) built Offshore Patrol Vessel ICGS Vikram was commissioned into the Indian Coast Guard on April 11, in the august presence of MoS defence Subhash Bhamre, at L&T’s defence shipyard at Kattupalli, near Chennai. The vessel is the ‘First of Class’ of seven new generation Offshore Patrol Vessels (OPVs) contracted by ministry of defence (MoD) to L&T in March 2015, under the government’s initiative of ‘Make in India’. DG Coast Guard Rajendra Singh, Commander Coast Guard Region (East) IG Rajan Bargotra, CEO & MD, L&T S.N. Subrahmanyan, Whole-time Director (Defence) and Member of L&T Board J.D. Patil, MD & CEO L&T Shipbuilding Vice Admiral B. Kannan (retd), and other dignitaries graced the occasion. The defence ship, after its keel was laid in March 2016, was completed within a time-frame of 25 months of build period including trials and commissioning. “Given the opportunity and level playing field, L&T can provide the much-needed impetus to the augmentation of Indian Naval and Coast Guard fleets through in-house design and timely delivery of vessels,” added Subrahmanyan. The OPV project has scored many firsts in India’s nearly six decades of defence shipbuilding history. The entire design and construction of OPVs has been carried out in-house by a private sector shipyard – L&T Shipyard. ICGS Vikram class OPVs are long-range surface ships, capable of operation in maritime zones of India, including island territories and equipped to handle helicopter operations. The role of an OPV is to conduct coastal and offshore patrolling, policing maritime zones of India, control and surveillance, anti-smuggling and anti-piracy operations with limited wartime roles. “L&T defence shipbuilding capabilities have come of age with over two decades of rich experience in design, engineering and construction of complex defence platforms and three decades of track record in platform specific equipment and systems. On-time commissioning of first of the class OPV ICGS Vikram underlines excellent design and execution capabilities of L&T. In the past one year, 11 new build platforms were launched/ delivered by L&T, all ahead or on schedule. Today, L&T is uniquely placed to address complete value chain of Defence Shipbuilding from design to manufacturing of critical ship equipment, modular construction and through life support,” said Jayant Patil.